Introduction to Computational Contact Mechanics: A Geometrical Approach covers the fundamentals of computational contact mechanics and focuses on its practical implementation. Part one of this textbook focuses on the underlying theory and covers essential information about differential geometry and mathematical methods which are necessary to build the computational algorithm independently from other courses in mechanics. The geometrically exact theory for the computational contact mechanics is described in step-by-step manner, using examples of strict derivation from a mathematical point of view. The final goal of the theory is to construct in the independent approximation form /so-called covariant form, including application to high-order and isogeometric finite elements. The second part of a book is a practical guide for programming of contact elements and is written in such a way that makes it easy for a programmer to implement using any programming language. All programming examples are accompanied by a set of verification examples allowing the user to learn the research verification technique, essential for the computational contact analysis. 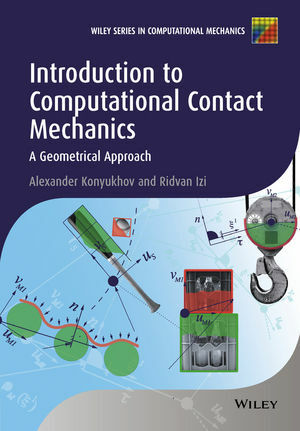 Introduction to Computational Contact Mechanics: A Geometrical Approach is an ideal textbook for graduates and senior undergraduates, and is also a useful reference for researchers and practitioners working in computational mechanics. Alexander Konyukhov has been working at Karlsruhe Institute of Technology in Germany since 2002, where he has made his Habilitation in 2010 in the field of Geometrically exact theory of contact interaction. His main areas of research are computational and theoretical mechanics. He is recognized expert in the field of Computational Contact Mechanics, authors of other books in Computational Contact Mechanics and has numerous publications in international journals. His special teaching interest in Computational Contact Mechanics has led to this book. Ridvan Izi is a member of the academic staff in the Institute of Mechanics at Karlsruhe Institute of Technology. His work focuses on computational contact problems.